This July, in what will surely be a sweltering Dallas-Ft. Worth summer, Glen Beck is working to bring 100,000 hard-working souls to Dallas with “their sleeves rolled up and ready to serve.” The service is supposedly humanitarian in nature, though it is hard to tell with the fuzzy details provided by the front group that is organizing the event. 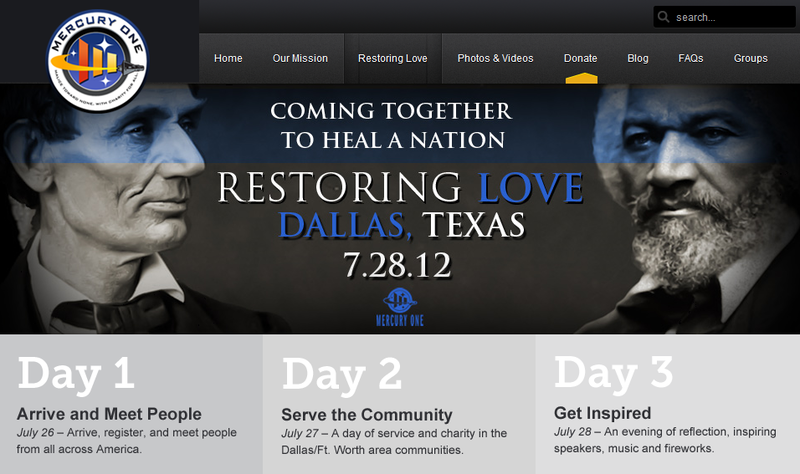 Who is Mercury One, this organization which has “partnered” with Glen Beck to conduct the “Restoring Love” event? On July 11, 2011, Beck himself presented his new non-profit venture, named just the day before, “Mercury One.” Its goal? “Saving the nation, one person, one family, one entrepreneur, one town at a time.” Want to see for yourself? Click here. So the charity that “partnered” with Glen Beck was actually started by Glen Beck! While Mercury One appears to be a humanitarian organization, one would be too simple-minded not to listen beyond the rhetoric. Is it any accident that Beck speaks of “saving America” in this project? I know salvation has a double-meaning, but I’m immediately suspicious because Beck’s version of faith will damn one person at a time, not save them. Does Beck simply imply a salvation of the American dream? I doubt it. Why the doubt? First, I find suspicion in the fact that “preparedness,” a key virtue of Mormonism, is part of the mission of Mercury One. In fact, each of the 11 purposes of Mercury One seems to be Mormonism dressed in terminology that will not cause alarm. This is where I have to say “Wait a minute!” Now we are no longer dealing with a humanitarian organization, but an organization that wants to help me in faith matters. Anyone who ventures into this kind of event should insist on a doctrinal statement, and should agree with that statement. How can I partner with an organization whose stated purpose is to assist me in the application of my faith without knowing what their doctrinal beliefs are? How can I join with those who want to “mobilize individuals to improve the human condition physically, emotionally, and spiritually” if I do not know how “spiritual improvement” is defined? Since Beck is an avowed Mormon, I can only assume that “spiritual improvement” is defined by the standards of the Church of Jesus Christ of Latter Day Saints. Whether this is indeed the case, or even if Beck is calling for a sweeping ecumenical initiative, the danger to orthodox faith is very real. Many will think I need to chill a bit and “not look a gift horse in the mouth” as the old Texans used to say (A statement that encourages gratitude by recipients of gifts). My problem is that I think Pastors and church-members have chilled way too much in recent years, to the point where we are now lukewarm. What do I expect to see? Sadly, I expect well-meaning but ill-informed Christians to join Mercury One in its mission, to travel to Dallas by the busloads, and to come home to their churches rejoicing in the “mission work” they did. Even more sadly, I expect to see Pastors and church leaders enthusiastically endorse this movement as one of love and even as “Christlike.” The church has given up so many of her doctrinal distinctives for the sake of crowd building that now she cannot see the wolf among the sheep. In closing, let me remind church leaders that missions without the Gospel is not really missions. The church better refocus its missionary efforts to something more exclusive than humanitarian projects. Such projects, while well intended, can be carried out by any organization under the sun. Let’s spend our church time doing what only the church can do: proclaim salvation through Jesus Christ. Let me also encourage Pastors to name-names when it comes to bad theology being introduced into the church. Such was the practice of Paul, who feared the day when “savage wolves will come in among you, not sparing the flock” (Acts 20:29).